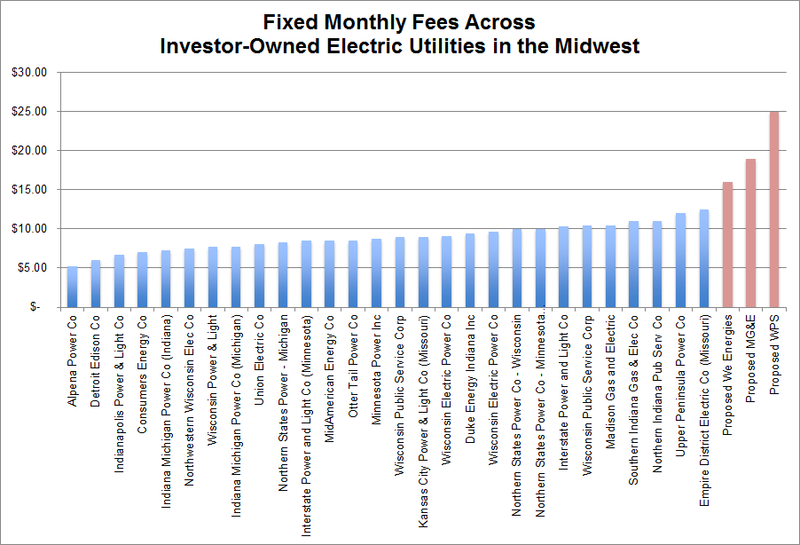 Wisconsin's investor-owned utilities are outpacing the rest of the Midwest in looking to increase monthly service fees for customers. A new analysis from Renew Wisconsin shows the proposed hikes here would leave renters, homeowners and small business owners paying significantly more than customers in neighboring states. Electric utilities in Wisconsin are struggling with how to cover the “fixed” costs of operating and maintaining electric systems — the poles, wires and other infrastructure — amid the increase in solar power usage and energy conservation. They want to dramatically hike the monthly service fees for most customers while reducing charges for the amount of electricity consumed. But critics contend the changes will discourage customers from using less electricity and are simply a way for utilities to book higher profits to benefit their shareholders. Green-Bay based Wisconsin Public Service Corp. is the latest investor owned-utility in the state to seek a major hike its in monthly services fees. The company is asking regulators to OK an increase its monthly fee from $10.40 to $25 for residential customers. For small commercial customers, the monthly fixed charge would go from $12.50 to $35. Those increases would be offset by a reduction of 10 percent to 13 percent on the charges for the amount of electricity used. Last year, the state’s largest electric utility WE Energies was granted a 20 percent increase in fixed charges by the Public Service Commission and is now proposing a 75 percent jump in its fixed charge to $16 a month. MGE had initially talked about raising the monthly customer charge from about $10 a month to nearly $50 by 2016 and potentially $70 by 2017. But an agreement reached with the Citizens Utility Board now proposes raising the fee to $19 in 2015 and holding off on future hikes pending future negotiations between CUB and MGE. MGE's rate changes are being opposed by a variety of consumer and clean energy groups. The city of Madison is also fighting the changes and has approved spending up to $60,000 to hire outside experts to make their case before the PSC. Regulators are expected to make a ruling on the service fees changes later this year. Wisconsin was once considered something of a leader in energy conservation and renewable energy development. But under Gov. Scott Walker the state has fallen behind in those efforts, studies have shown.